NASA used software, replicating the colors of human sight, to obtain this beautiful image. Gotta love when artistry, technology and science combine…amazing. Imagine watching the sunset and not seeing a reddish-orange sky, but instead a magnificent brilliant blue. If you’re sitting on a ridge on Pluto’s surface, that’s what you would experience. It wouldn’t come from an atmosphere spreading the light spectrum across the sky, but from a sunlight induced chemical reaction of nitrogen and methane. The small soot-like particles, tholins, created as they settle toward the surface creating an amazing blue glow. The particles are gray or red, but the way they scatter blue light is a tell of their composition and size. Here on Earth, we know them to be tiny nitrogen molecules, but on Pluto they are a bit larger and forming high in Pluto’s atmosphere. Ultraviolet sunlight breaks them apart and ionizes the nitrogen and methane molecules allowing them to create complex positively and negatively charged ions. The reaction doesn’t stop there. 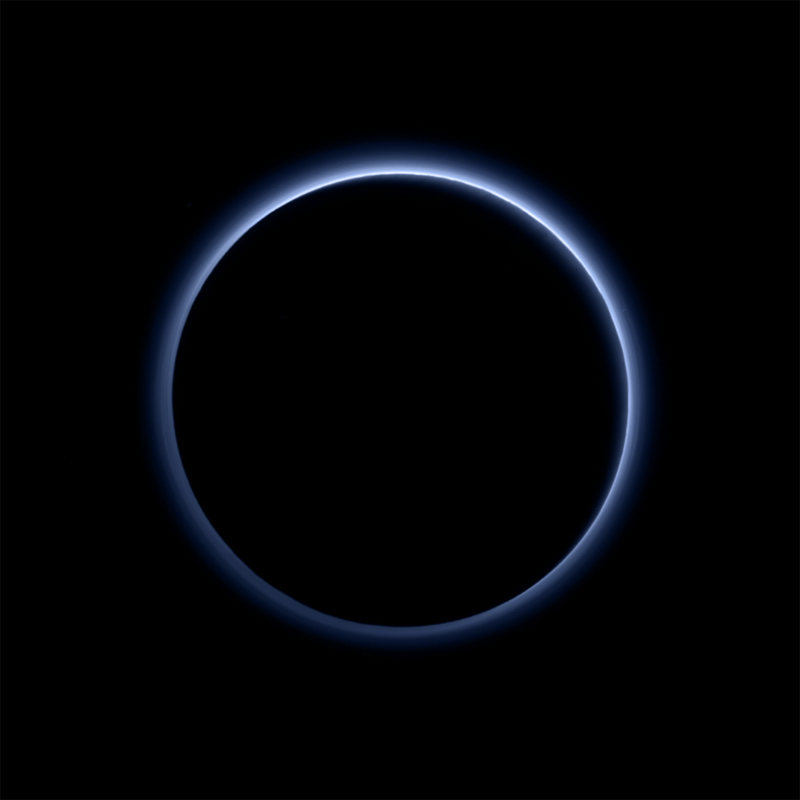 They continue to grow and become coated with ice frost before falling through the atmosphere to the Pluto’s surface contributing to the red landscape. Another great find, surface water ice. Shown on the map above in blue, the strongest signatures of water ice appear along the Virgil Fossa, west of th Elliot crater (left side of image) and in the Baré Montes (right side of image). Most of the surface does not contain water ice, but more volatile ice, and why these regions have water ice is one of many challenges scientists will explore. October 11, 2015 in Exploration, Main Page, Science.